Perhaps three quarters of Christians belong to churches that pray to dead saints. But is that what God wants? What does the Bible say about prayer and saints? A few years ago an acquaintance was telling my wife and me about a tradition that would purportedly ensure you would be able to sell your house quickly. 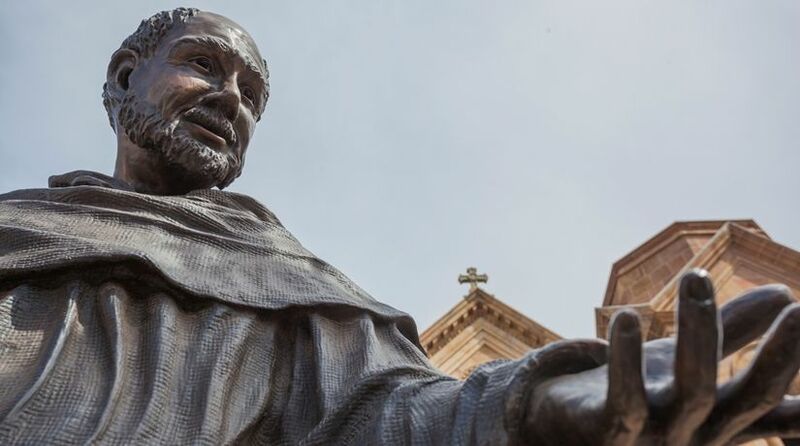 You were supposed to bury a statue of St. Joseph upside down in your yard. The newspaper article even told about New Yorkers Cari Luna and her husband, who were having a hard time selling their house, as offer after offer kept falling through. Joseph is just one of hundreds of saints that Catholics, Eastern Orthodox and members of some other churches turn to when in need. Another saint that was very popular for centuries was St. Christopher. But in 1969, “the Church took a long look at all the saints on its calendar to see if there was historical evidence that that saint existed and lived a life of holiness. In taking that long look, the Church discovered that there was little proof that many ‘saints,’ including some very popular ones, ever lived. Christopher was one of the names that was determined to have a basis mostly in legend. Therefore Christopher (and others) were dropped from the universal calendar” (Catholic Online). Now the criteria for being named a Catholic saint are much stricter. To be called a saint, generally a dead person must be credited with having performed two miracles. But is that what the Bible says? What about the thousands of saints who have been recognized by the Catholic and Orthodox churches? Does the tradition of making statues of saints and praying to saints go back to the Bible—or to some other source? A full history of the veneration of saints is beyond the scope of this article. But consider a couple of fascinating threads. Rodney Stark, codirector of the Institute for Studies of Religion at Baylor University, traced the assimilation of paganism into the Roman Church in his book The Triumph of Christianity. “The peasants tended to respond to Christianity as they always had to the appearance of various new gods within paganism—to add the new to the old, rather than to replace it. Hence Jesus and various saints were simply added to the local pantheon” (2011, p. 196). This process included making pagan temples, magical springs and pagan festivals “Christian” by associating them with martyrs and their relics (bones, hair, etc.). Dr. Stark points out, “It also has been generally accepted that some minor local saints are overlays of equally minor, local pagan deities” (p. 197). But does this just apply to minor saints? The practice of praying to saints is based on the idea that they are now in heaven listening to those prayers. But what does the Bible say about where the saints are today? Jesus Christ plainly said, “No one has ascended to heaven” (John 3:13). The apostle Paul stressed the need for Christians to be resurrected—brought back from the dead. And he explained when this resurrection will happen—“at the last trumpet” (1 Corinthians 15:51-52) at the return of Jesus Christ to this earth. “For the Lord Himself will descend from heaven with a shout, with the voice of an archangel, and with the trumpet of God. And the dead in Christ will rise first” (1 Thessalonians 4:16). Jesus taught His followers to address their prayers directly to God the Father, and He said we should do it in His name (Matthew 6:9; John 14:13). What a wonderful privilege to be able to go directly to God! We don’t need human or angelic intermediaries, since Jesus Himself is the “one Mediator between God and men” (1 Timothy 2:5). We can and should each regularly “come boldly to the throne of grace, that we may obtain mercy and find grace to help in time of need” (Hebrews 4:16). Who do the saints pray to (and worship)? The followers of Christ—the saints—obeyed His instructions and prayed to the Father. They worshipped God only. The Bible records a time when the apostle John came into the presence of a powerful spiritual being, and even though he was in awe and fell down before the being, he was quickly reminded to only venerate and worship God. “Then he said to me, ‘See that you do not do that. For I am your fellow servant, and of your brethren the prophets, and of those who keep the words of this book. Worship God’” (Revelation 22:9). Could veneration of saints be idolatry? If saints are dead in the grave, not in heaven, why would we pray to them? If we can talk directly to God, with Jesus Christ interceding for us, why would we pray to saints? The biblical answer is that we should worship and pray to God only—not to saints. Read more about how God does want us to pray in our free study guide How to Pray.